The paper below conducts an allele frequency analysis on admixture graphs, which contain information about branching population histories. Thanks to recent studies, they now have enough data to run the analysis on educational attainment as well as height. Among their results: a clear signal that modern East Asians experienced positive selection (~10kya?) for + alleles linked to educational attainment (see left panel of figure above; CHB = Chinese, CEU = Northern Europeans). These variants have also been linked to neural development. An open question in human evolution is the importance of polygenic adaptation: adaptive changes in the mean of a multifactorial trait due to shifts in allele frequencies across many loci. In recent years, several methods have been developed to detect polygenic adaptation using loci identified in genome-wide association studies (GWAS). Though powerful, these methods suffer from limited interpretability: they can detect which sets of populations have evidence for polygenic adaptation, but are unable to reveal where in the history of multiple populations these processes occurred. To address this, we created a method to detect polygenic adaptation in an admixture graph, which is a representation of the historical divergences and admixture events relating different populations through time. We developed a Markov chain Monte Carlo (MCMC) algorithm to infer branch-specific parameters reflecting the strength of selection in each branch of a graph. Additionally, we developed a set of summary statistics that are fast to compute and can indicate which branches are most likely to have experienced polygenic adaptation. We show via simulations that this method – which we call PhenoGraph – has good power to detect polygenic adaptation, and applied it to human population genomic data from around the world. 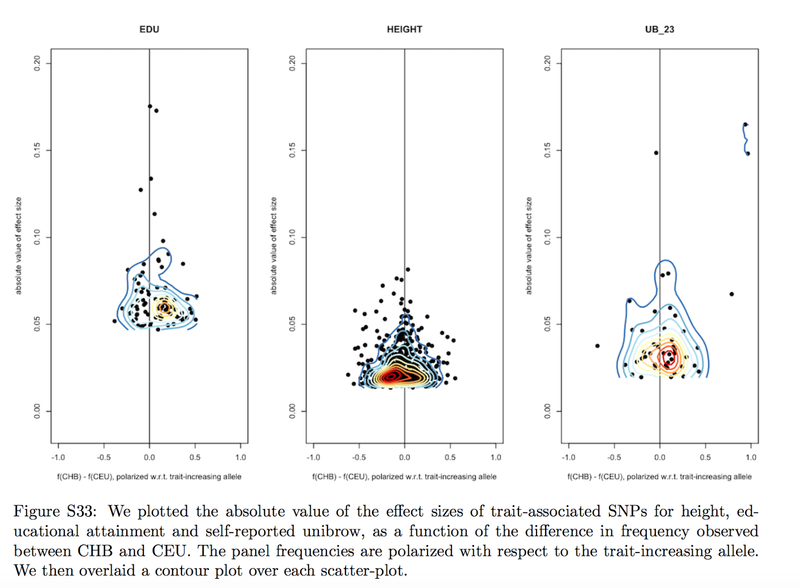 We also provide evidence that variants associated with several traits, including height, educational attainment, and self-reported unibrow, have been influenced by polygenic adaptation in different human populations. We find evidence for polygenic adaptation in East Asian populations at variants that have been associated with educational attainment in European GWAS. This result is robust to the choice of data we used (1000 Genomes or Lazaridis et al. (2014) panels). Our modeling framework suggests that selection operated before or early in the process of divergence among East Asian populations – whose earliest separation dates at least as far back as approximately 10 thousand years ago [42, 43, 44, 45] – because the signal is common to different East Asian populations (Han Chinese, Dai Chinese, Japanese, Koreans, etc.). 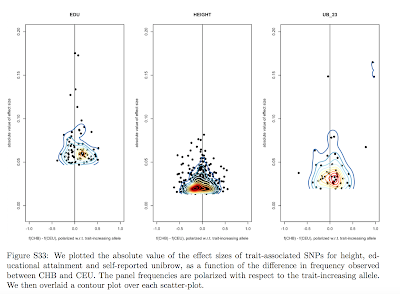 The signal is also robust to GWAS ascertainment (Figure 6), and to our modeling assumptions, as we found a significant difference between East Asian and non- East-Asian populations even when performing a simple binomial sign test (Tables S4, S9, S19 and S24).